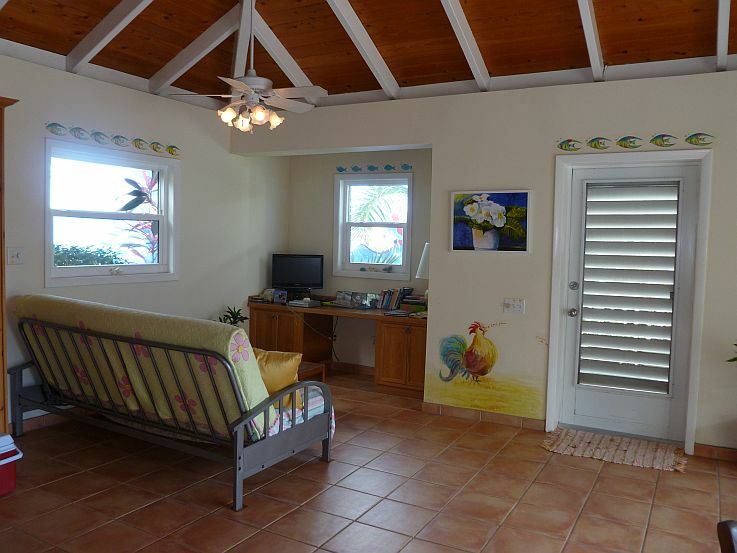 Enjoy harbor views and the Coral Bay breeze from this cheerful, friendly island cottage located in slower-paced, historic Coral Bay. 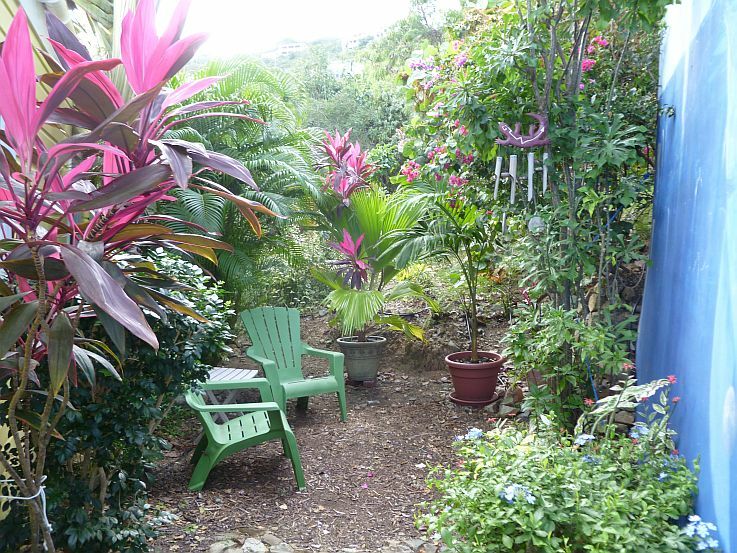 It’s a comfortable, colorful, and spacious home with lush gardens, lots of privacy and an expansive deck. This is not a shared environment; it is completely private with your own house and gardens. 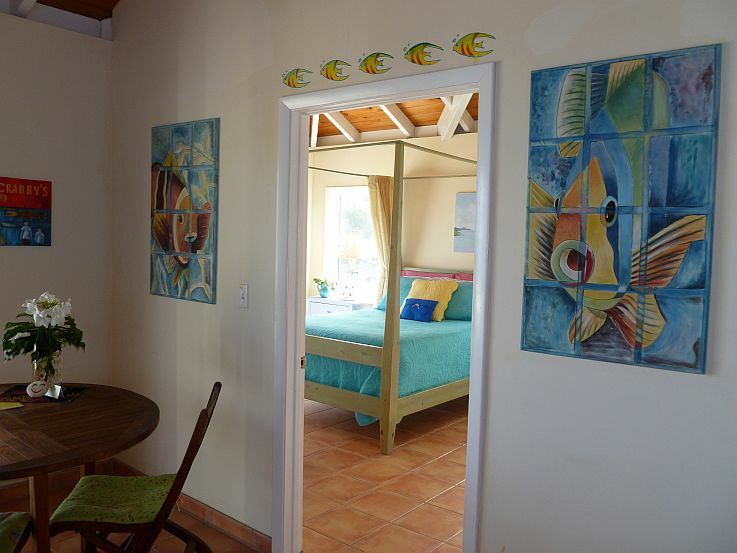 Beautiful white sand beaches for sunbathing, swimming and snorkeling are just a few minutes away or you can stroll over to Crabby’s, rent a kayak and snorkel gear and paddle over to a secluded beach not accessible by car. 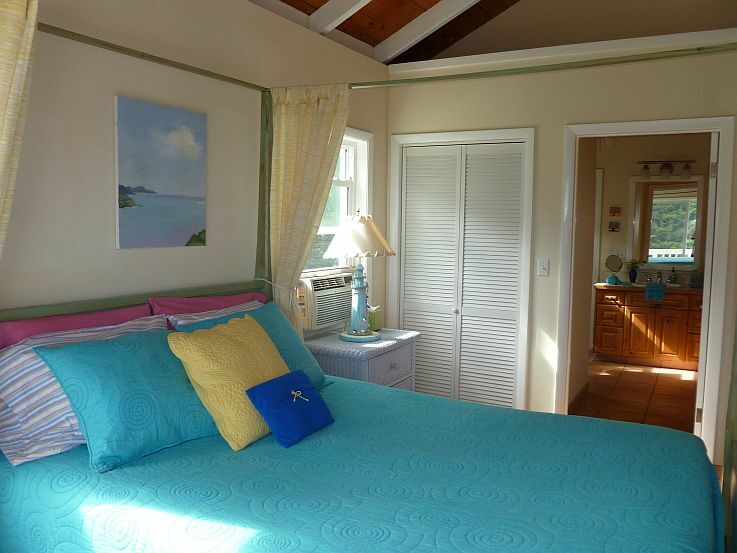 Island Cottage is only a 15-minute drive to north shore beaches and a couple of miles to Salt Pond Bay beach. Please add your name, number in your party and your dates when you email. 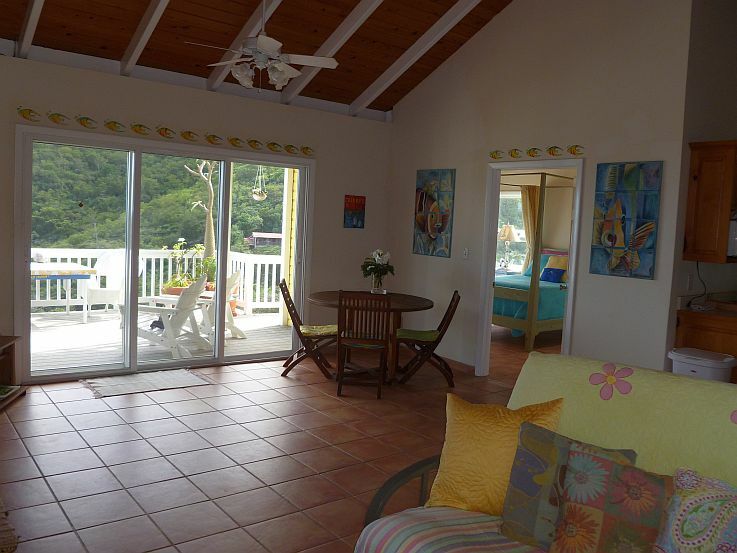 Island Cottage is in the village of Coral Bay; just a stroll from the harbor. 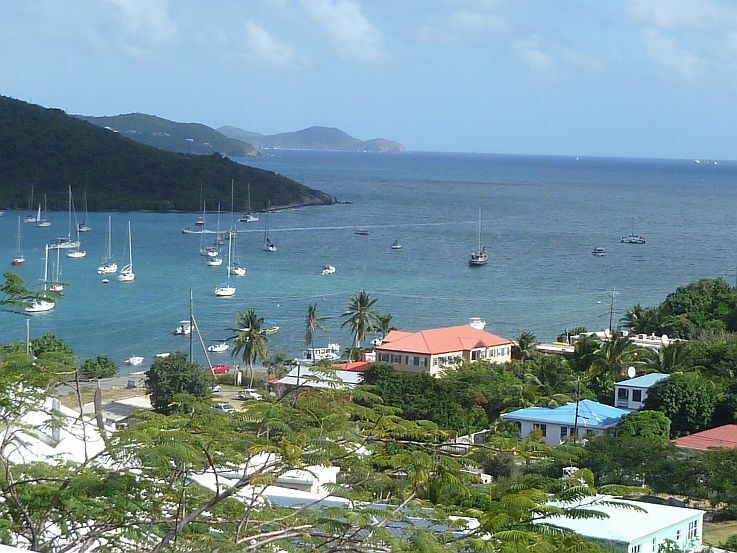 Coral Bay is known as the laid-back community of St. John and is considered by many to be the sailboat anchoring area of choice. Many of these sailboats are homes to village residents. 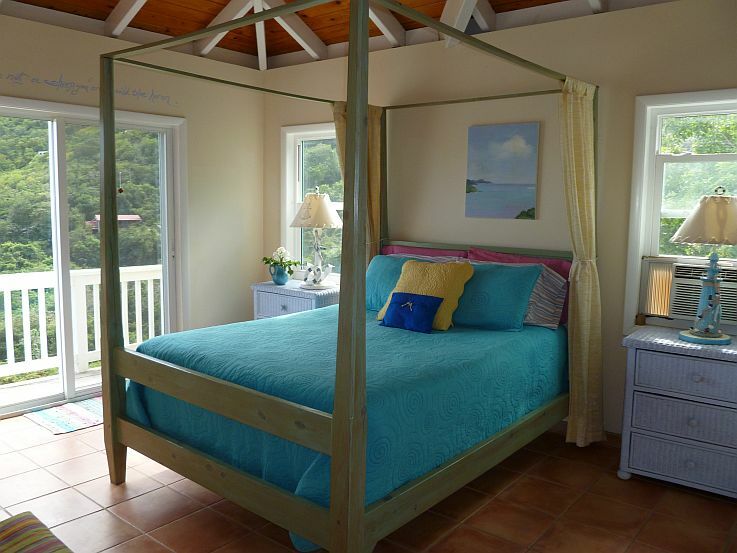 This enchanting island cottage is highly recommended for anyone looking to escape the busy race of life. Relaxing here is only too easy. 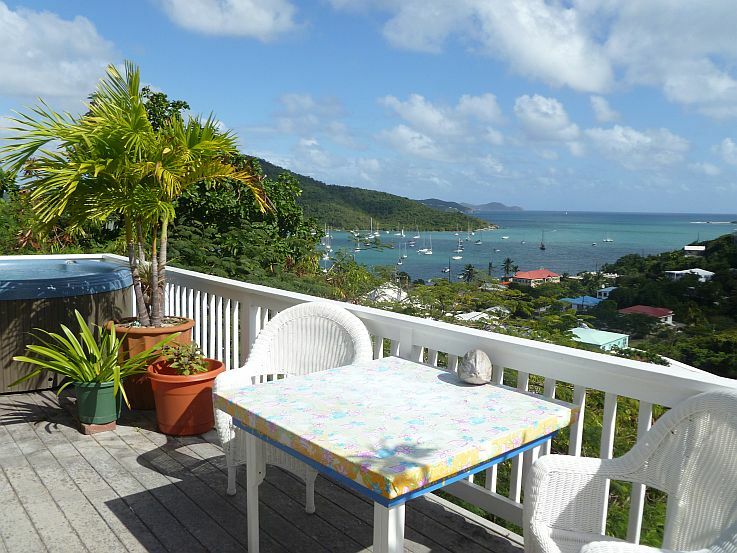 It is cozy, light and airy and offers breathtaking views of Coral Bay Harbor with sailboats dotting the water. 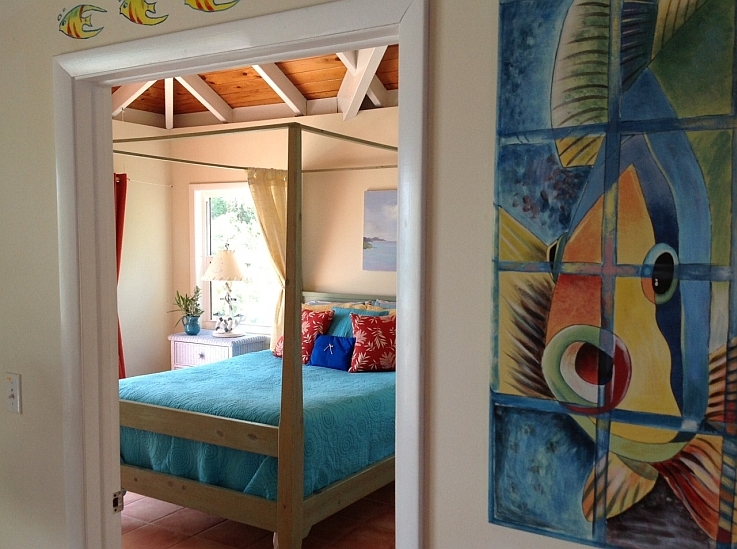 This sweet Caribbean cottage is magic. 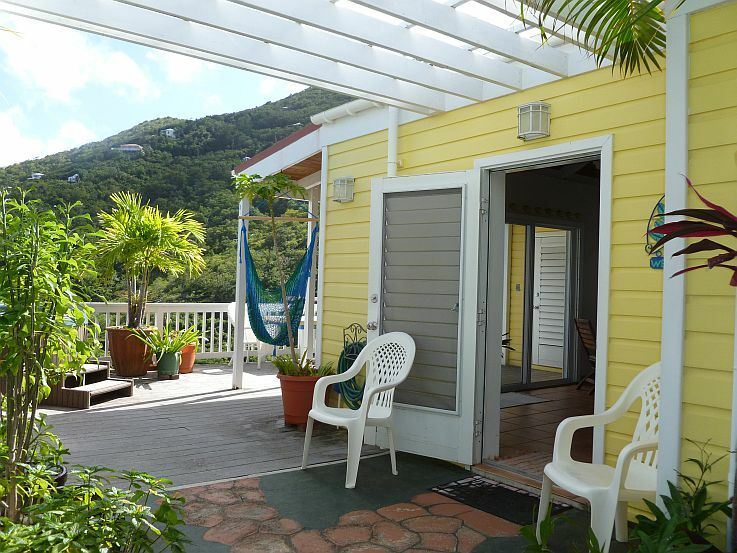 You can be sipping Pina Coladas from the deck of this cottage while enjoying spectacular views of Coral Bay Harbor. In the evening enjoy your dinner while watching the breathtaking sunsets and the moon rise. You also have a wonderful view of Orion’s Belt and other spectacular constellations of stars. 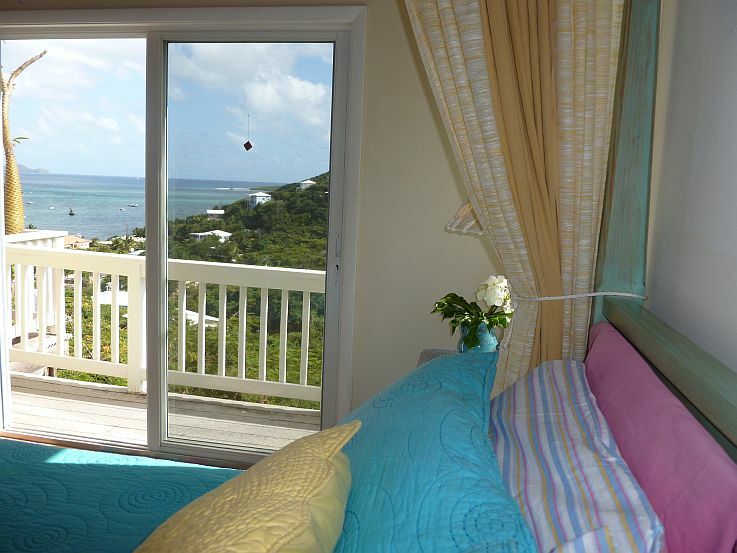 View of Coral Bay from the deck can also be seen inside cottage living room and bedroom. The owners are artisans and this shows up in this home. One of the things to consider on St John is the access road. 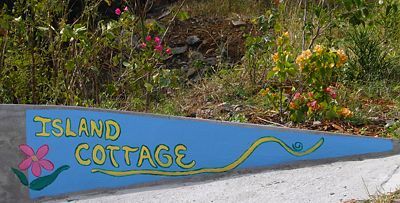 Many houses on St. John have unpaved roads that might be “interesting” at first and challenging by the end of the week. 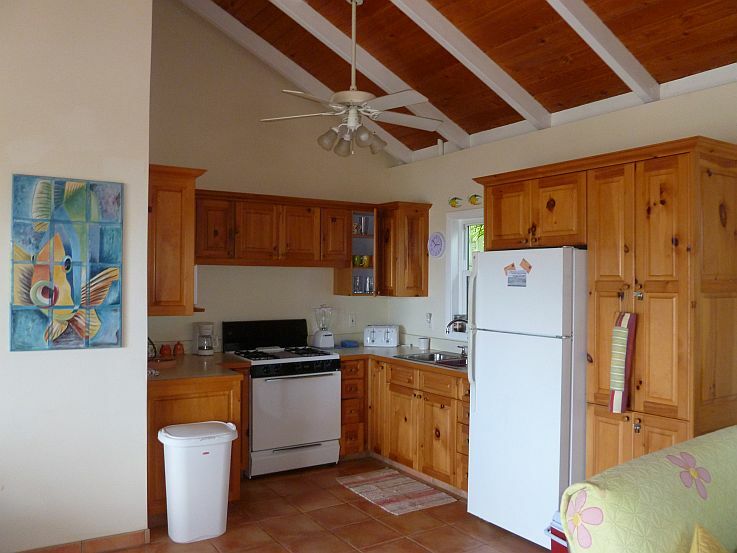 Island Cottage has very lovely paved access and great parking arrangements. 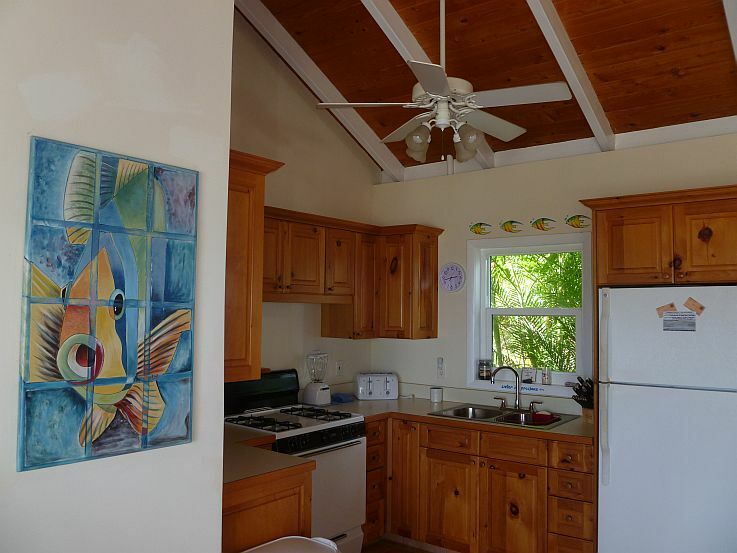 Check out Island Cottage owners Cape Cod 5 bedroom, 4 bath rental named Saturday Farm just a third mile away from Sea View Park and a half a mile away to Belmont and Sea Street beach. In the fall and winter the fireplace is available and in the summer the outdoor fire pit is a treat. Perfect for weddings, family gatherings, reunions, gramma’s 90th birthday. We had the most wonderful vacation in this beautiful home. 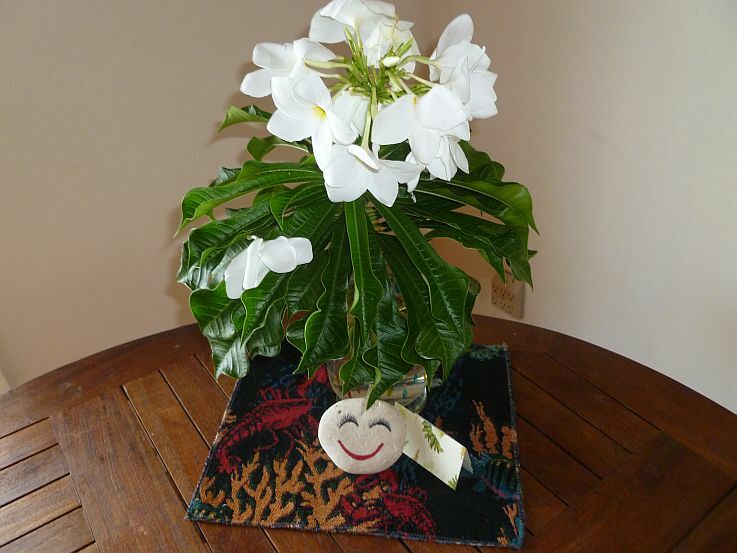 The house is absolutely perfect–Cindy and Harry have created a lovely, peaceful, and completely comfortable home at Island Cottage and Tracy set things up so nicely, it was such a pleasure to arrive there after our long trip. 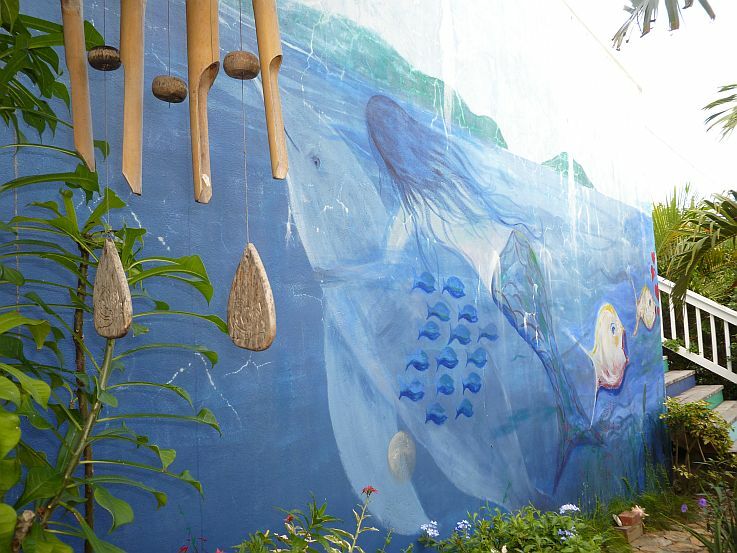 The colors, the breeze, Cindy’s lovely paintings and mural, and the wonderful furnishings and thoughtful touches made it a complete pleasure to live there for the week. They really have thought of everything that anyone could need. 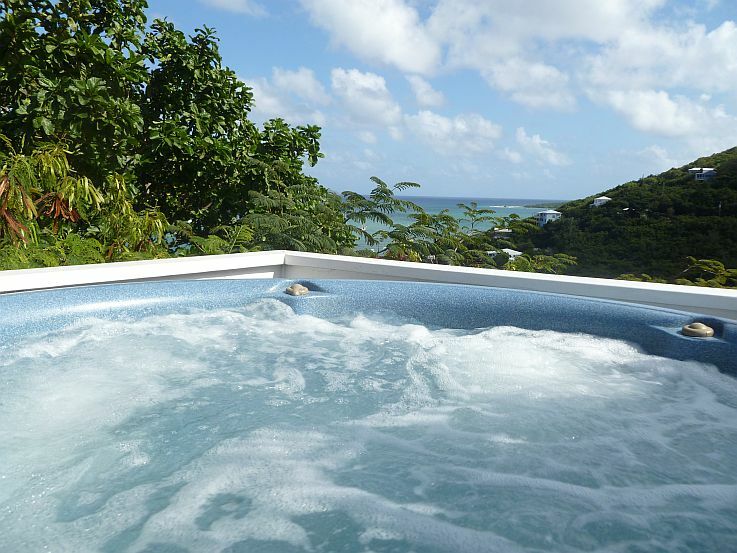 We all loved sitting on the deck watching the sunrise and moonrise, the hot tub was incredibly restful–my back has not felt this relaxed in years! We enjoyed the wonderful breezes at night through the screened doors. The kids were so comfortable in the futon. Even our toy poodle Shadow loved the house–he sat for hours in the sun on the deck while we ate, read, and relaxed. The house was so lovely it was sometimes hard to leave, but we managed to pull ourselves away to get to the incredible beaches. Crabby’s was great for all of our snorkel and beach gear, and the guys at LL Jeep rental were terrific too. We ate at some great restaurants in Coral Bay (we especially loved Sweet Plantains for a special night out before we left. Thanks to the recommendation in the guestbook). This was a wonderful vacation and we plan to stay in this wonderful home again. Kate and Bradbury; New York, New York. 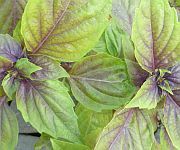 We really enjoyed reading the “green manual” that was there for us. The info on the restaurants and the menus were so nice to have. And…you have created in me a monster! I MUST find a recipe for that cappuccino custard from Aqua Bistro!! I can hardly stand to think about it now…especially since I can not have any! The ENTIRE experience was so perfect…more than I can even put into words. 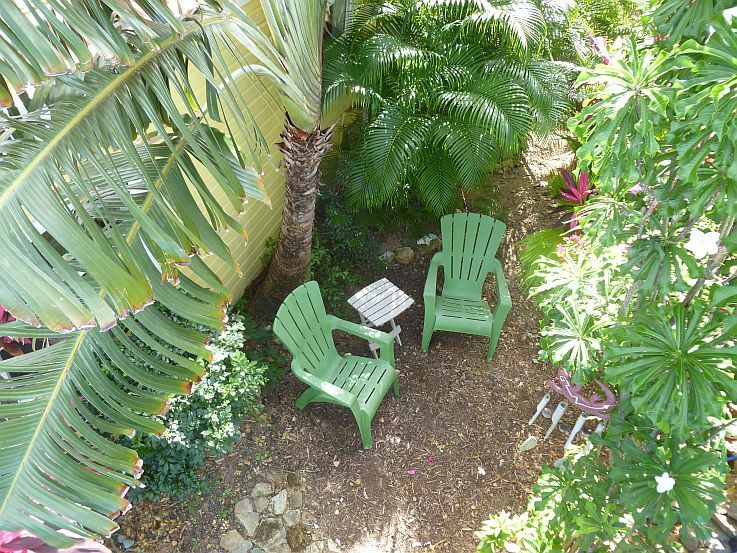 I have already ordered a hammock chair for my own backyard…the view is not the same….but while reading in it…I can dream about a place I never knew existed and am already longing to return to. Thanks again for sharing your paradise with us. We will be back for sure!!!! We just got our pictures developed today and the lady at the pharmacy asked me “where in the world did you go that looks like that?” I think I put a little “St John bug” in her today too! It IS catching you know!! Can you tell we just LOVED the entire place???? Everyone needs to know about your place and get to experience a piece of paradise like we did. Just want to tell you that we are now returned to our home, and we have had a very good and eventful vacation. Except for our hotel in Manhattan, we were very pleased with all the places we have chosen to stay. But Island Cottage was the very best! We felt at home in the first moment, we were there. 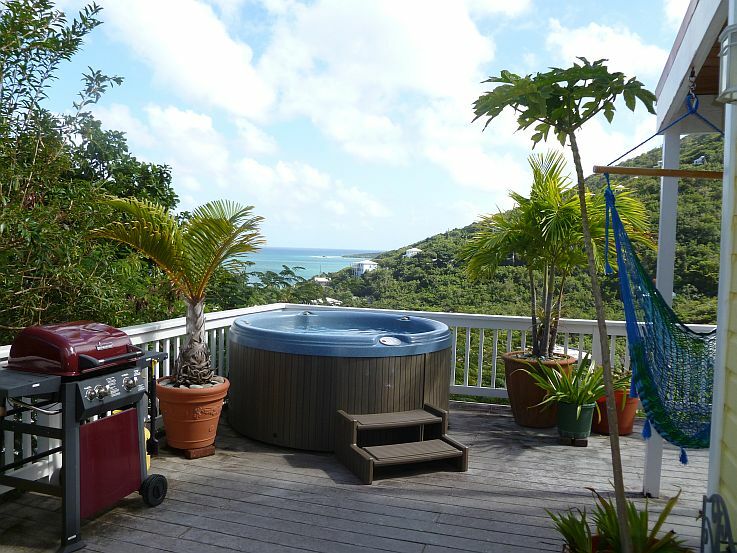 We loved to stay on the deck and did not go out to dine in the evening, much better to grill at home and enjoy the view of the harbor or the stars! We had no problems with bugs, and we did not miss A/C, which I have been afraid for (the only thing I missed in the house was something to place hot things on- did not want to spoil Harry’s table). So we felt really unhappy when we had to leave. The time was going so fast. We also want to say thank you for the welcome basket. Nice of you. 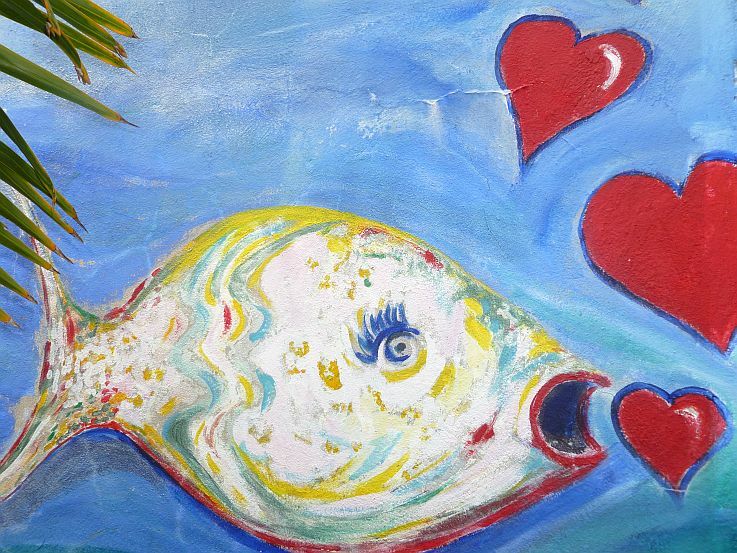 “At midnight, the cool breezes from Coral Bay ran up the hillside, over the deck, and through the house. The church bell, a mile away, could be heard ringing throughout the valley. Happy New Year! No loud parties, no fireworks, and a few far-off voices could be heard from the boats some 200 yards away anchored for the night in the beautiful bay. If you seek constant entertainment, pool parties, cocktails served all day, dancing in the club or nightly bar hopping, this is not for you! 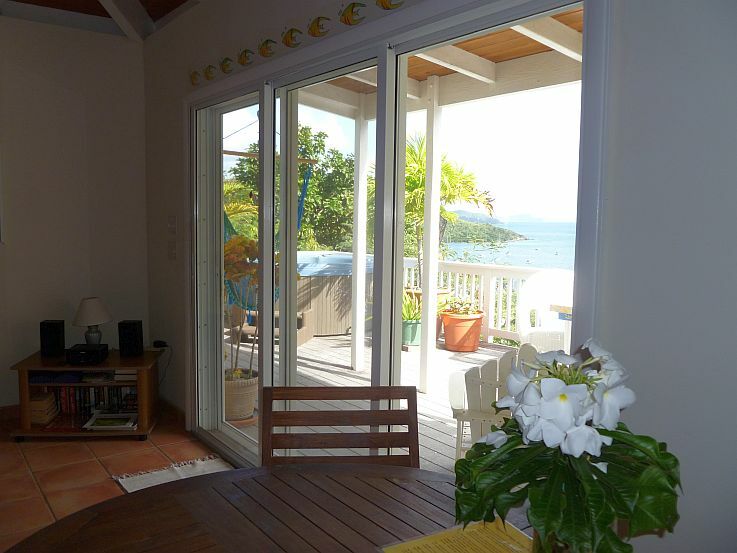 I have a high-stress job and I found the perfect getaway, not only St John but this lovely 1 bedroom home. 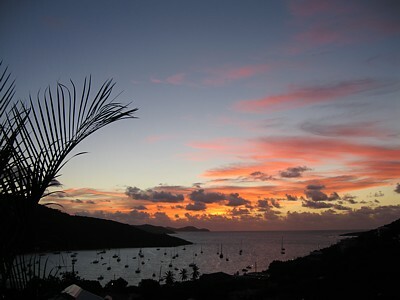 St John is a quiet, serene, laid-back island. The people are very friendly and helpful. I found none of the usual Caribbean attitudes here. 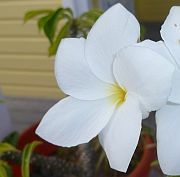 My family takes a few trips every year and after visiting Hawaii, Aruba, St Kitts, Nevis, Nassau, St Lucia and Puerto Rico, this is, by far, the cleanest, friendliest and most beautiful of all the Caribbean islands. 3/4 of the island is a national park. Now, for the Home. 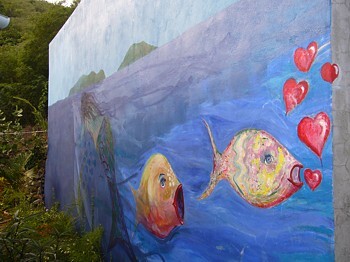 It is located on the quiet side of the island, about a 25-minute drive from the port of Cruz Bay. A great drive through the hillsides, passing some of the most beautiful views I have ever seen. 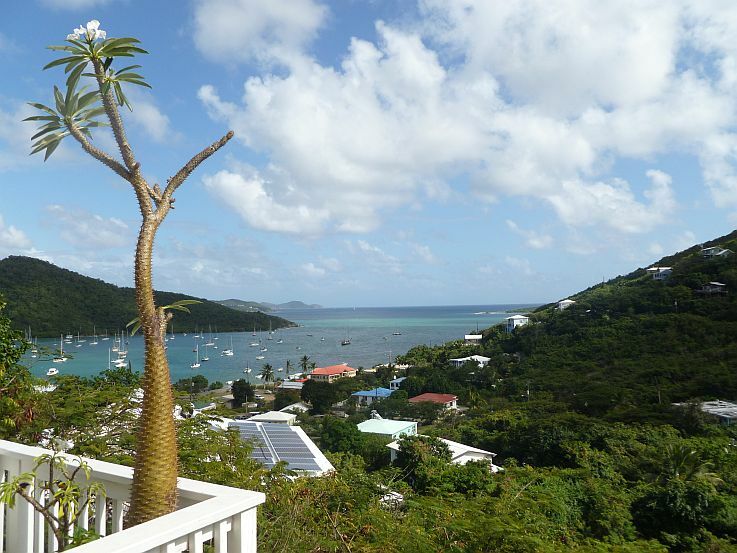 The Home sits above Coral Bay and juts out from the side of the hill. The breezes run through the house all day. Three glass sliding doors open in the living room bringing the outside in. 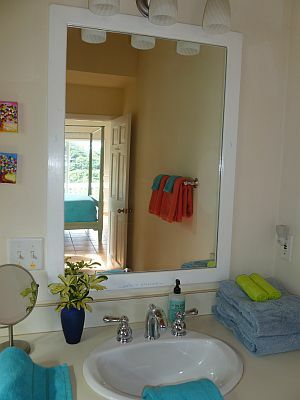 The house is brand new, clean, comfortable, convenient and absolutely welcoming. We are a family of four and we loved it! 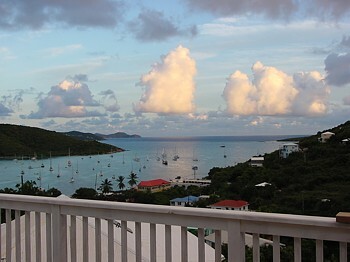 We grilled out on the deck while enjoying some rum drinks, eating breakfast and dinner on the deck on a table the owner made (very impressive), we played dominoes while watching the ships in the bay, watched the sunrise with our morning coffee and felt like we were at a dear friends home on vacation. Anything you could want was here. 2 minutes to the local food market, 3 minutes to a local eatery called Skinny legs (great burgers and beer) or Aqua Grille (great Mahi Sandwich) and 2 minutes to a local breakfast eatery called the donkey diner (don’t be fooled, it looks like a dump, but once inside you are wowed by the charm and fantastic breakfast. The most amazing part of this house was its view, night and day. I can not tell you how peaceful it was to sit in the hammock, feeling the breezes from the bay, enjoying a good Belgian beer and looking up at the stars at night. I spent hours and hours on the deck, morning, noon and night. It was intoxicating! The owners have thought of everything. If you need a place to connect with your wife and kids, this is it. No distractions. Pure family time in a magical place. And, before I forget, the beaches! Every day we set off for a new cove, a new Bay or new hillside to hike, 5 minutes to Maho Bay (great for small kids), 7 minutes to Francis Bay (great for solitude with the clearest water I have ever seen), and 10 minutes to Lamshur Bay and Europa Bay. Bring a few good books. Dvd’s can be rented next to the food market. The television has no local programming but DVDs for the kids are available. My son and I took 3 dive days while on the island. We got our certification from 6paqscuba. Small company and very personal service. We took a dive boat out and we were two of eight, not one of those cattle boats. Ask for Collete. 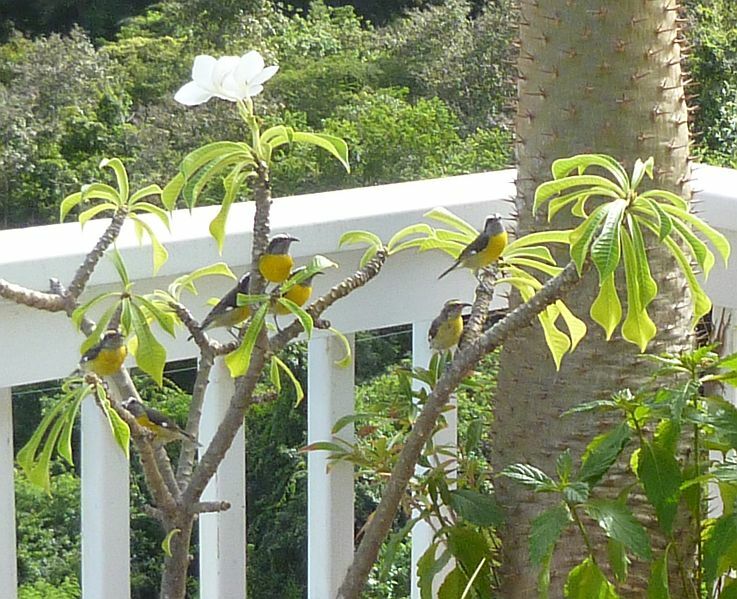 Also, the owners have a friend on the island who looked in on us to make sure we had all that we needed. She was great and we hired her to do a once over during the week and a final clean up after we left. Tracey was a Gem! All in all, when you book online, it is a big leap of faith “is this a good location? Is this a good house? Is it safe? Is it going to be what we need? If you want peace, quiet, privacy, with all the comforts of home, with the most beautiful view you can imagine, then you found it here. If you want cruise type activities or resort crowds, you might try somewhere else. This is heaven and not for those who need to be entertained by others. 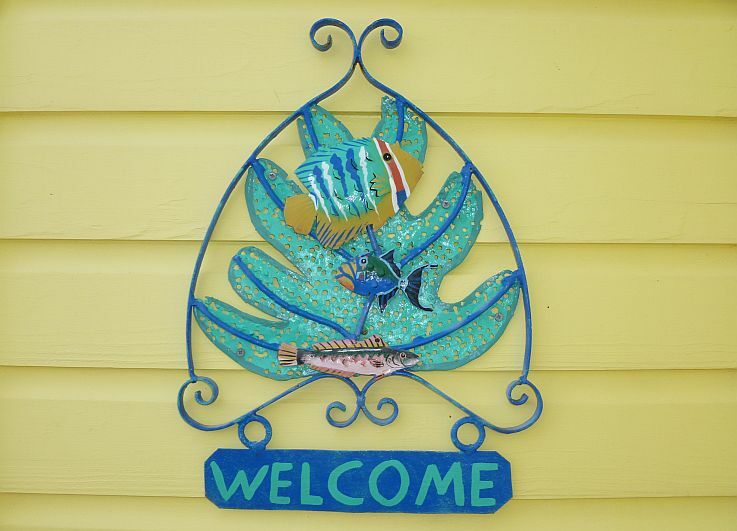 “We highly recommend this wonderful cottage for anyone looking to escape the busy race of life. Relaxing here is only too easy.. 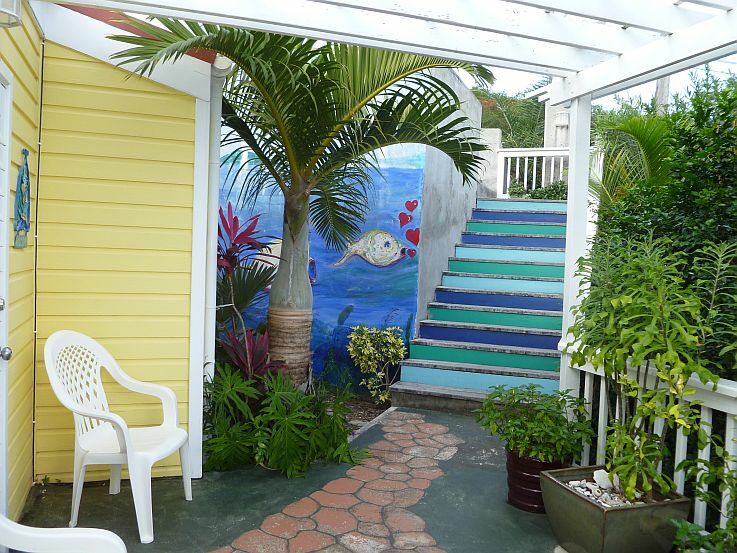 This cottage is cozy, light and airy and offers breathtaking views of Coral Bay Harbor with sailboats dotting the water. There is easy access to many beautiful beaches and the snorkeling was terrific everywhere we went. There are many great places to dine out and two convenient grocery stores just up the street. It won’t take long and you won’t want to go home, ever. This place is “Life is Good”.